Often, there are restaurants in the locations that just don't seem accessible. Some are located off alleyways (such as Judas Goat and Salt), some are hidden in industrial complexes (such as Calypso and 2 Chefs) and some are prominent from street level, but most people just drive on by without stopping. The location of our latest food adventure led us to the corner of Hastings and Boundary. Yes, a busy intersection indeed, but not really a place one would usually stop for food. This is especially true for the Northeast corner because it sits at the very far end of the Heights while not really in the heart of the Vancouver side of Hastings. That is probably why the former European restaurant gave way to its current tenant - No. 1 Chinese Restaurant. Now this post will consist of 2 parts. Why? Well, I had visited the place with my family first and was about to publish the post when I was ironically invited for dinner by the owner. I applaud them for extending the invite even though I had already eaten there on my own dime. So the first part will be my initial visit and the second will be the invited dinner. Nice way to compare both experiences too. At first, we were a bit confused with the decor because the Swiss-like country murals still adorned the walls. Was it going to be Swiss-Chinese fusion? That would certainly be interesting! Nah, with many Asian restaurants, they put the money into the food rather than seemingly frivolous luxuries such as renovations. Hey, it's a small family-run restaurant, I ain't complaining! We decided to go for the "build-your-own-meal" which included a Pumpkin Seafood Soup to start. It didn't sound that promising, but in the end it was not bad. The starch-thicken broth was sweet, but not pumpkin pungent. 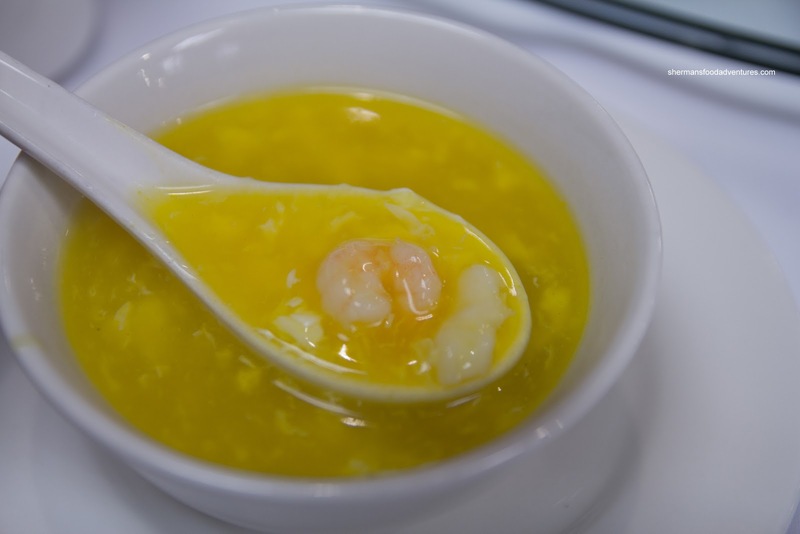 It featured properly prepared bits of seafood (shrimp and scallops) which added some nice snap texture to the silky soup. 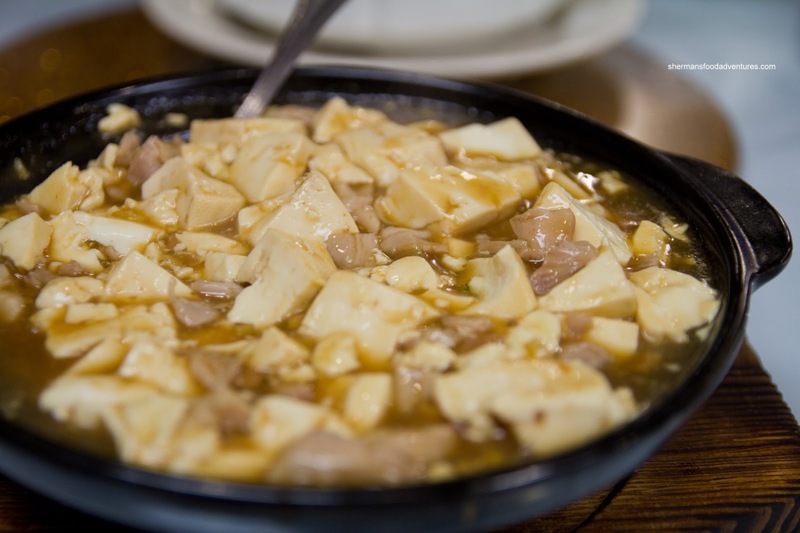 When the weather is cold, hot pot dishes seem to hit the spot, so we got the Salted Fish, Chicken & Tofu Hot Pot. This came out bubbling and chock full of stuff. The tofu was soft and silky while the chicken was tender. Although there was a lot of salted fish (the hard type), the flavour didn't penetrate into the sauce. However, the sauce was not exactly bland either. 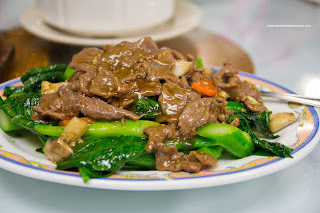 Next up was the Gai Lan with Beef. 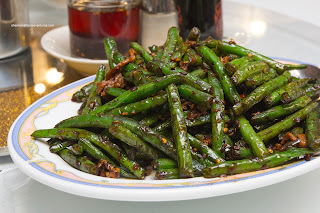 This was a healthy portion where the gai lan was vibrant in colour with a nice bite. The plethora of beef was probably sauced a tad too much, yet was easy to chew while not over-tenderized either. For the kiddies, we got the Scrambled Eggs with Shrimp. 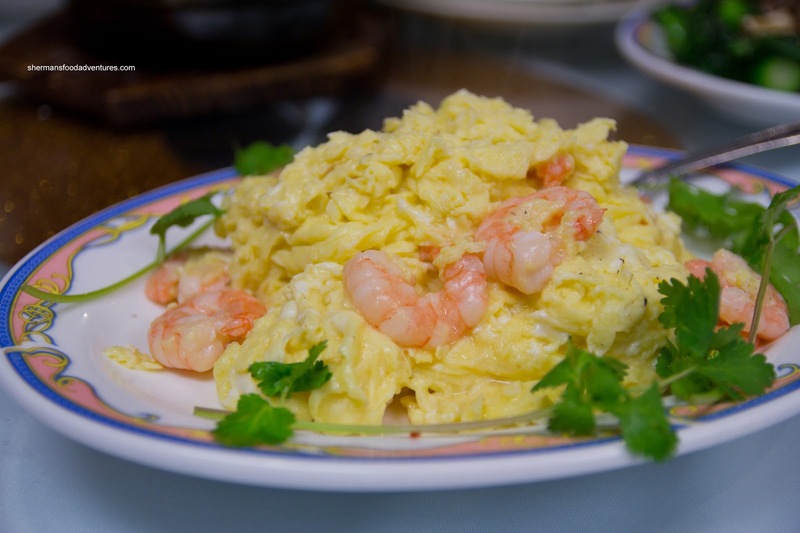 Much like any test of skill, scrambled eggs done correctly is difficult. Now imagine making lots of it and in a high BTU wok pit. Of course it involves a lot of babying including the addition of starch and oil (as well as seasonings). This one was more or less a good attempt. The eggs were fluffy and not too greasy. The shrimp were large and exhibited a good snap. Looking for something a bit different, we opted for the Sing Qua with Pork Cheek. 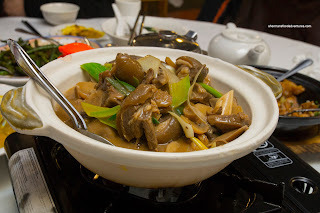 This was a mild dish with lots of textures including chewy pork cheek (in a good way), juicy sing qua as well as crunchy wood ear mushrooms, carrots and onions. Lastly, we had a spicy dish in the Twice Cooked Pork Belly with cabbage. I found the belly to be a decent compromise between moist and sufficiently cooked. What I mean is that the belly was not chewy in a fatty kind of way, which is quite off-putting in my opinion. The cabbage was crunchy while the sauce was somewhat spicy (we would've liked it hotter), but I can understand that the heat level was set for the mass appeal. Okay, now for our second visit, we started off with the 4 Seasons Green Beans which were well-prepared. As you can clearly see in the picture, there was a good level of wok heat which led to a caramelized colour and flavour (use of dark soy probably helped too). Unlike many of versions of this dish, the pork was julienned rather than ground. We liked this as we could actually pick it up with our chopsticks and eat it. The spice level was medium while we appreciated the lack of saltiness. Next up was the Fish & Tofu Hot Pot. Again, this was a well-portioned dish where the fish could've been sliced thicker because it ended up to be too crunchy. However, the flavours were balanced between savoury and sweet (where it wasn't overly salty). For this meal, we were able to order whatever we wanted, but it was suggested we try 2 of their very best dishes. The first one was the Curry Brisket and Tendon. I was skeptical about the suggestion, but after one sample, I understood why. The rich curry was spicy with full-bodied flavour. 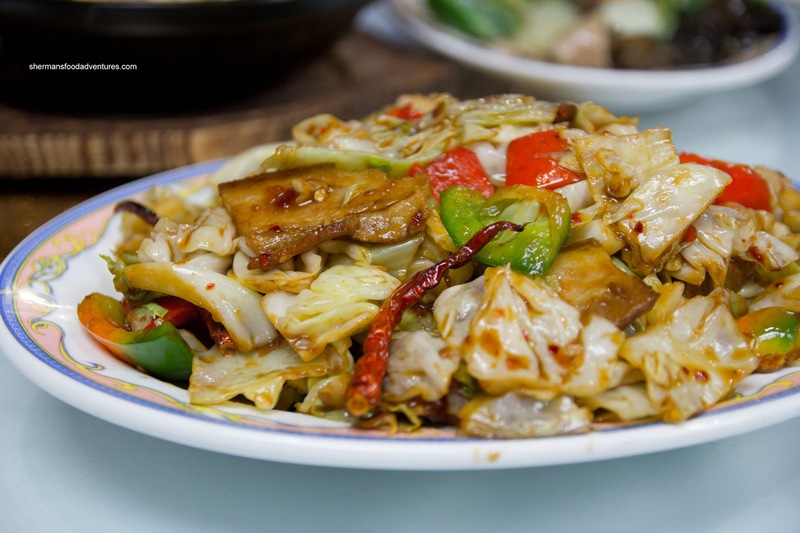 It was not a starch-thickened goop like most other Chinese restaurants. 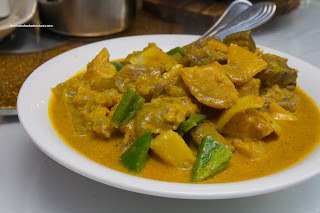 With a hint of coconut milk and a big hit of curry, I wanted to eat more and more of it. I found that the only thing that could be better was the brisket and tendon - they could've been slightly more soft. On our last visit, my mom spied the table next to us and they were dining on the Lamb Hot Pot. Well, there was no doubt we'd try it this time around. Despite being one of their pricier items, it was a very large portion. The flavours were again quite balanced with only a modest amount of gaminess. Much like the previous dish, the only thing that could've been better was the tenderness of the lamb (sounds like some weird romance novel or Anthony Hopkins flick...). 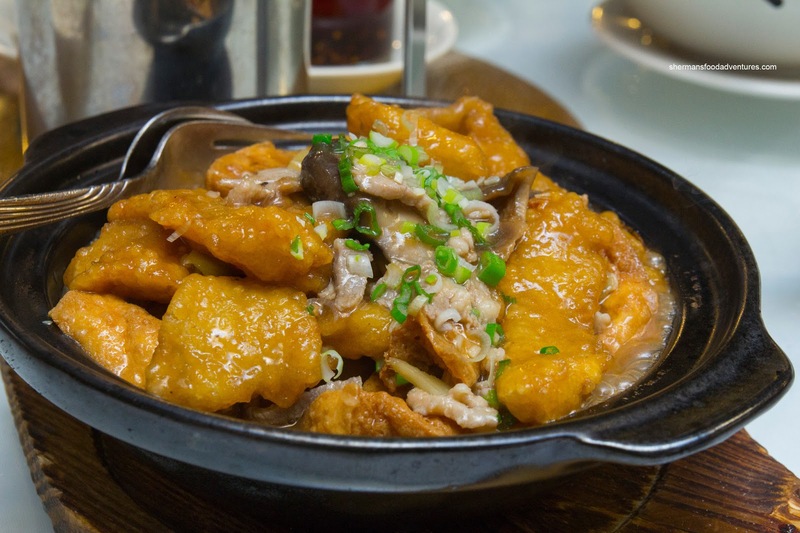 Last, but certainly not least, was the Golden Fried Silken Tofu. This was another recommended dish and I was a bit puzzled. Fried tofu? Really? Well, I ate my words as this was fantastic. 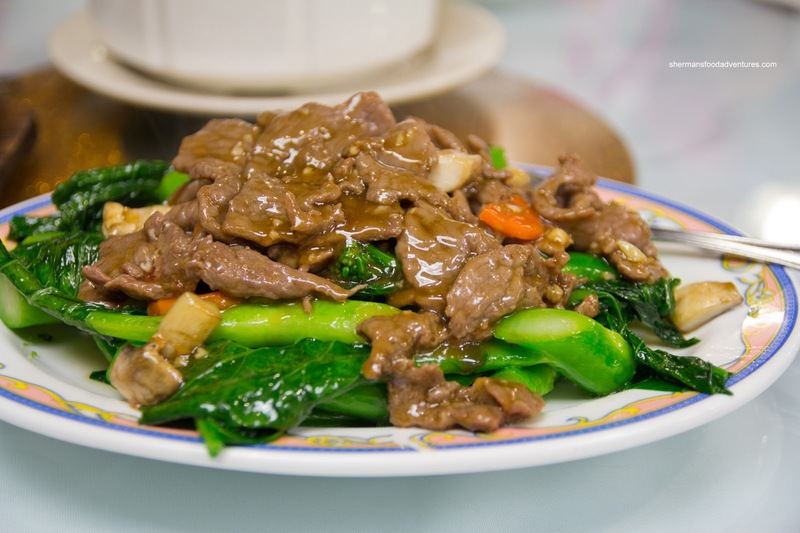 In fact, I'm going to add it to my Top 40 (well, now 41) things to eat in Vancouver. 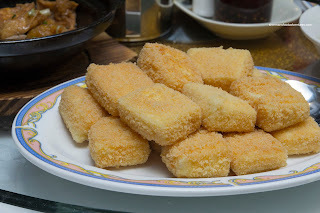 The crispy breading on the outside was light and seasoned just enough where it caressed the perfectly cooked silken tofu (which was beautiful contrast). I couldn't stop eating these. This was a fine ending to 2 above-average meals. 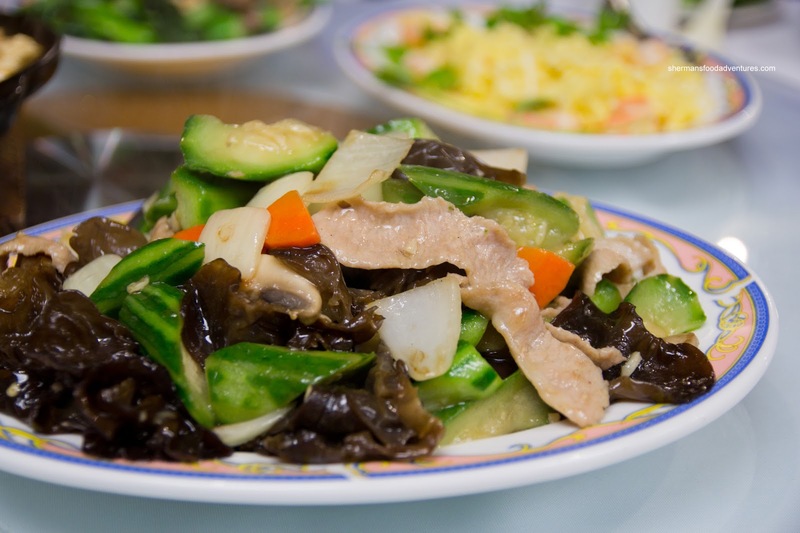 For a small family-run restaurant, the food is good, well-portioned and reasonably-priced. 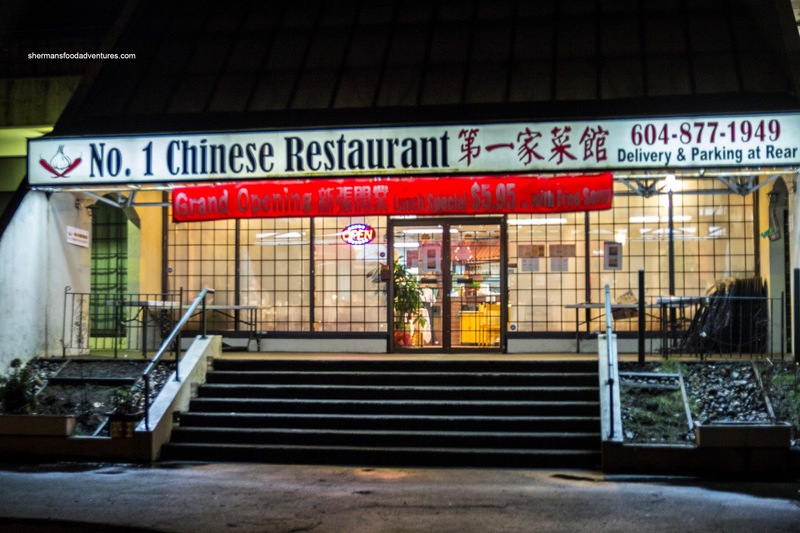 A fine addition to North Burnaby, where decent Chinese food is severely lacking. Thanks for the thorough post, it's close to me and my mom love lamb hot pot too! 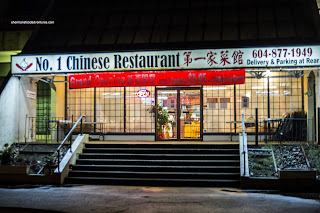 For not-too-expensive-but-good North Burnaby Cantonese dinner, which do you recommend more: No. 1 or Wah Lun? I would say the food at No. 1 is probably a bit better, but the decor at Wah Lun is better. So it depends what you value more... I'd take better food. I LOVE this place but as of as of November 14 2013 they are out of business. Drove by today and they have covered the windows with paper. Sad but they said it was just a bad location. I wish them all the best in the future as they were SO good.